A weekly newspaper has commemorated the 25th anniversary of a terrorist bombing which killed two children on its patch. 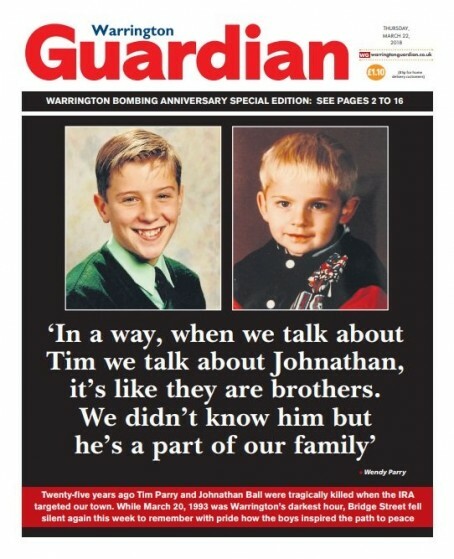 The Warrington Guardian has remember the IRA bombing on 20 March 1993, which claimed the lives of Johnathan Ball and Tim Parry. The Guardian dedicated its first 16 pages of this week’s newspaper in memory of the pair, featuring in-depth interviews with both their families. The IRA planted two bombs in the town centre, which also left more than 50 other people seriously injured. Three-year-old Johnathan was killed instantly in the second blast, while Tim, 12, died five days later after fighting for his life in hospital. Tim and Johnathan’s families shared some of their favourite childhood photographs of the boys with the Guardian, while the paer also spoke with the family of Bronwen Vickers, who was left fighting for her life after the attack but died a year later from the same skin cancer disease she had once beaten while at university. Tim’s father Colin founded the Tim Parry Johnathan Ball Peace Foundation along with his wife Wendy, and a peace centre was built in Warrington in 2000 to help the victims of terrorist attacks around the world. Former IRA chief Martin McGuinness subsequently apologised to the victims’ families in a landmark meeting in 2001, however sadly the culprits have never been apprehended. The foundation is the Guardian’s current charity of the year. The edition also includes coverage of Tuesday’s special memorial service in the town, which was attended by hundreds of people, while the below picture featuring the boys, which was posted on the Guardian’s Facebook page, has been shared more than 6,000 times. 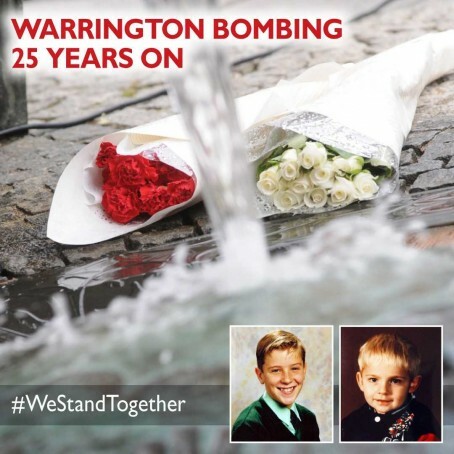 Editor Hayley Smith told HTFP: “Everyone remembers where they were when the bombs went off 25 years ago, it was a day that will be etched in people’s memories forever. It was a terrorist attack that shook the whole town and devastated innocent families. “As The Tim Parry Johnathan Ball Foundation for Peace is our charity of the year, we felt very strongly that this week’s Warrington Guardian, along with our dedicated online coverage, not only needed to be a fitting tribute to the boys and their families, but also to reflect the inspiring work being carried out every day by the team at the Peace Centre. “They are reliant on people’s generosity to ensure their work can continue. You can help by making a donation at Foundation for Peace.